(Trent Nelson | Tribune File Photo) SkyWest and Delta Connection passenger jets along Terminal E at the Salt Lake International Airport Wednesday, May 16, 2012 in Salt Lake City, Utah. Ten years ago this month, Delta Air Lines merged with Northwest — and promised that would finally create stability for customers and employees, help hubs including Salt Lake City to prosper, and show that consolidation is good for the industry. Delta is marking the anniversary of that fusion — the first of a flurry of mergers that sought to help airlines survive bankruptcies, low-cost competitors, high fuel costs and recession — by saying it kept all those promises, and that Salt Lake City is a big beneficiary. “We’ve essentially gone from fighting for our survival to a world where we are able to serially invest in our people and in our customers,” Paul Jacobson, Delta’s chief financial officer told The Salt Lake Tribune. He added that the merger helped to significantly increase employment and seats offered in Salt Lake — and investment in the airport. While Salt Lake City is Delta’s fourth largest hub (behind Atlanta, Detroit and Minneapolis), it is the airline’s fastest-growing, adding 25 percent more seats since 2014. Salt Lake is part of a Western tri-hub structure for Delta with Los Angeles and Seattle. Salt Lake “is more important and more valuable than it was as a stand-alone hub with a smaller West Coast presence prior to the merger," Jacobson said. 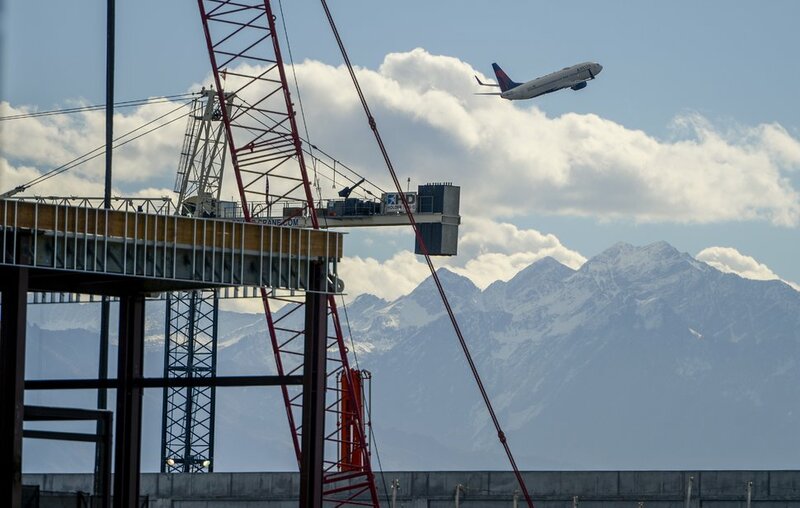 Fees paid by Delta will fund much of the ongoing $3.6 billion project to rebuild Salt Lake City International Airport. “It is a really big investment for us. I think it signals our value that we have for the airport and for the community,” Jacobson said. • The number of Delta employees in Salt Lake City grew from 3,000 to more than 4,400. The profit sharing they received grew from zero in 2008 to a combined $42 million this year. • Delta’s number of seats on flights departing here grew by 1.8 million yearly comparing 2008 to now, from 682,534 a month to 868,187. The number of departures actually decreased from 290 daily to 275 — but Delta is using more large aircraft now. • Delta’s destinations from Salt Lake City grew from 90 to 100. • The number of foreign countries served increased from three to five. Delta (with its international partners( is the only airline now offering nonstop international service from Salt Lake City. The 11 destinations are Amsterdam, Paris, London, Vancouver, Calgary, Toronto, Cancun, Guadalajara, Mexico City, Puerto Vallarta and Los Cabos). (Scott Sommerdorf | Tribune File Photo) Delta's first flight from Paris touches down at Salt Lake International Airport, Monday June 2, 2008. • Delta is by far Salt Lake City’s largest carrier: now operating 70 percent of overall seats and 73 percent of all departing flights. .• Delta is generally upgrading equipment used in Salt Lake City. Now, 53 percent of flights are on larger mainline jets (rather than smaller regional planes) compared to 37 percent five years ago. The average number of seats on Delta flights here now is 116, compared to 97 five years ago. Jacobson, who has been with Delta for 21 years and says he’s “lived with the best times and the worst times in the industry,” says the Delta-Northwest merger was ideal by matching airlines with different strengths. He adds that while Delta was once in bankruptcy before the merger, this “will be the fourth consecutive year that we have made $5 billion in profits” — and half of that is reinvested in the company.